I was browsing around and came across this: Ten modern day dukes dining together. In total, there are currently 24 dukes in Great Britain, according to the article, so these ten were a small sampling. The range is interesting. The Duke of Leinster (which is ridiculous; Leinster is in Ireland and Ireland doesn't have peerage anymore) works as a landscape gardener, while others own thousands of acres of land. The odd thing for me is that in researching background for stories, I've come across these men's ancestors and titles. 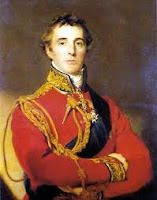 For the Regency era, the big name is the Duke of Wellington, who was given that title in 1814 after defeating Napoleon during the Peninsular Wars. Because the Peninsular Wars were fought in Spain and Portugal, the family still owns huge tracts of land in those countries, which had been gifted to the Duke after the wars were finished. And here's a Tudor connection as well. If you've ever watched The Tudors or read anything about Henry VIII, then you've likely come across these titles: Somerset. Norfolk. Northumberland. To those who have watched The Tudors, that's Edward Seymour (Henry's third wife's brother, who made himself a duke when he became Lord Protector of his nephew Edward); Norfolk, Anne Boleyn and Katherine Howard's uncle; and Northumberland, who didn't figure at all in the show. He figured quite a bit in Iggy's tale (and may still, should I ever be in the mood to go back to it), because Northumberland owned a great deal of the northern England and fought a lot against the Scots. Plus, there was a son of the Earl of the Northumberland (they weren't dukes yet) who fell in love with Anne Boleyn, but couldn't marry her. So much for the young, fit, rich, handsome duke. I guess a bit chubby and red-faced is more realistic?